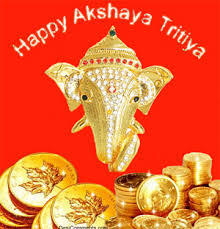 Akshaya Tritiya, also known as Akti and Akha Teej, is a holy day for Hindus and Jains. It falls on the third Tithi (lunar day) of Bright Half (Shukla Paksha) of the pan-Indian month of Vaishakha and one of the four most important days for Hindus. It is an auspicious day of the birthday of Lord Parasurama who is the sixth incarnation of Lord Vishnu. On this day Veda Vyas began to write Mahabharata. Jains celebrate this day to commemorate Tirthankara Rishabhanatha’s ending of one-year fast by consuming sugarcane juice poured into his cupped hands.